Nothing earth shattering here, but we all need some good basic, solid recipes to keep in our rotation, don’t you think? Especially when they involve making the entire dinner in one slow cooker! If you read my blog often, it’s no secret to you that I just love herbs! 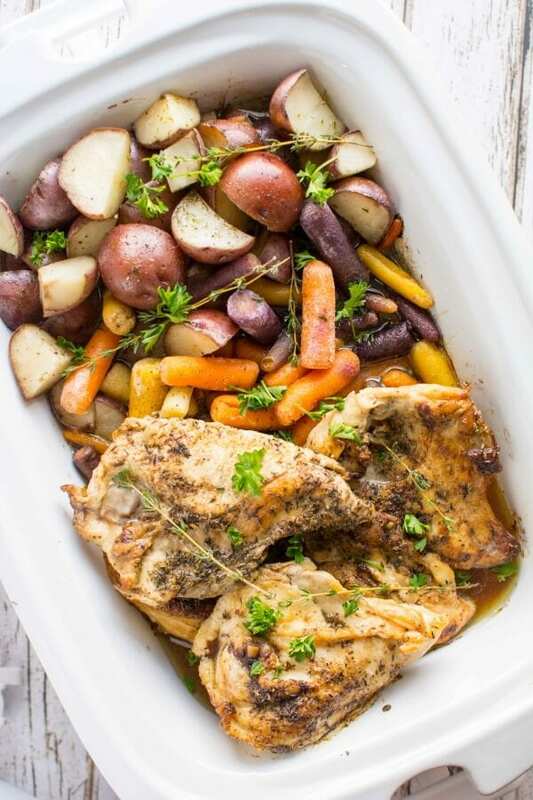 And what better to go with chicken, potatoes and veggies than herbs?! This makes for a fresh tasting, delicious and satisfying meal that pretty much everyone can find something to love about it. Did I mention all in one slow cooker? Whole meal done? Nothing else to do? Such a wonderful feeling when you don’t have anything to do once you’re home other than pull out the plates and get some drinks. Plus, this is really pretty easy to prepare as well. 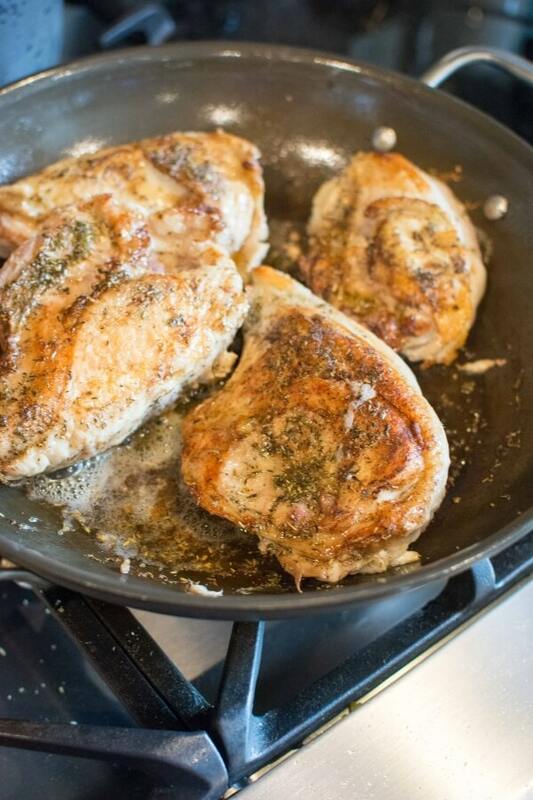 You do want to brown up your chicken a bit in a skillet but it only takes a few minutes. 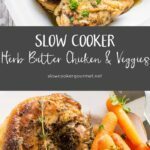 Everything then just goes right in the slow cooker and you drizzle the delicious herb butter right on top. I used my casserole crock to spread everything out but it’s fine to layer everything in a regular slow cooker too. 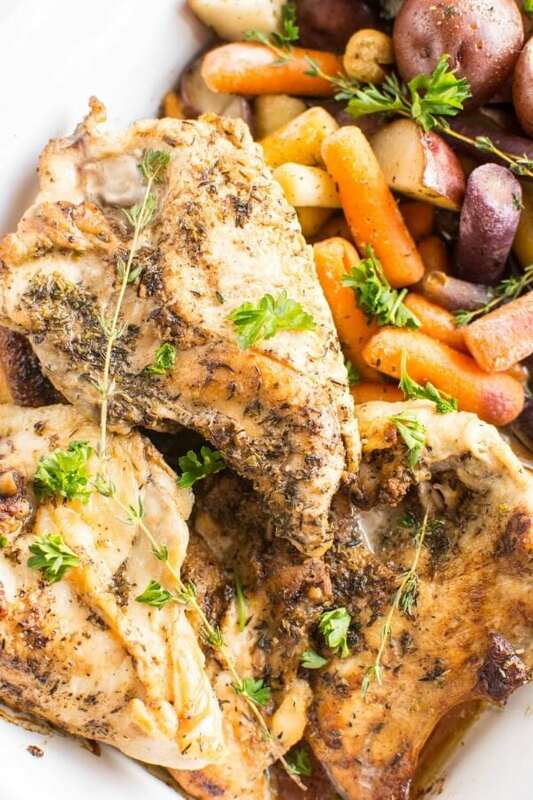 I suggest putting the veggies on bottom, drizzling them with the herb butter, then adding the chicken on top. I cooked this on high in my 3.5 quart casserole crock for 3 1/2 hours. 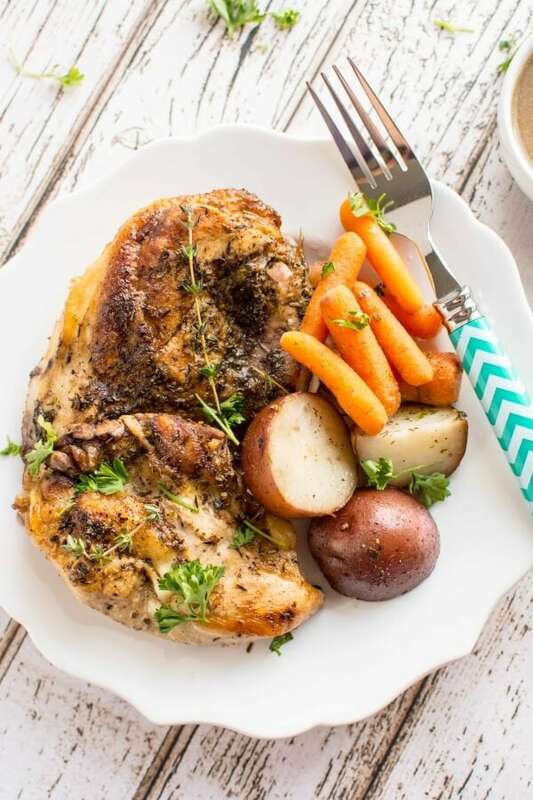 Could this recipe be done without browning the chicken first? I am looking for a few recipes that cover the entire meal (meat and veggies and/or a starch) that I can bring to a “10 dinners in an afternoon” party. Everything would be put in a freezer bag until it got popped into the slow cooker ready to make! Hi Amanda, yes you could make this without browning it first. Some just like a crispier chicken, so that is why Jennifer offers that suggestion. You can totally skip that step though to save time! This is the 2nd recipe I’ve tried in my new 3.5 qt. casserole crockpot, and it did not disappoint. Since I’m not a fan of breast meat, I used 2 breasts for my husband and 4 thighs for me. 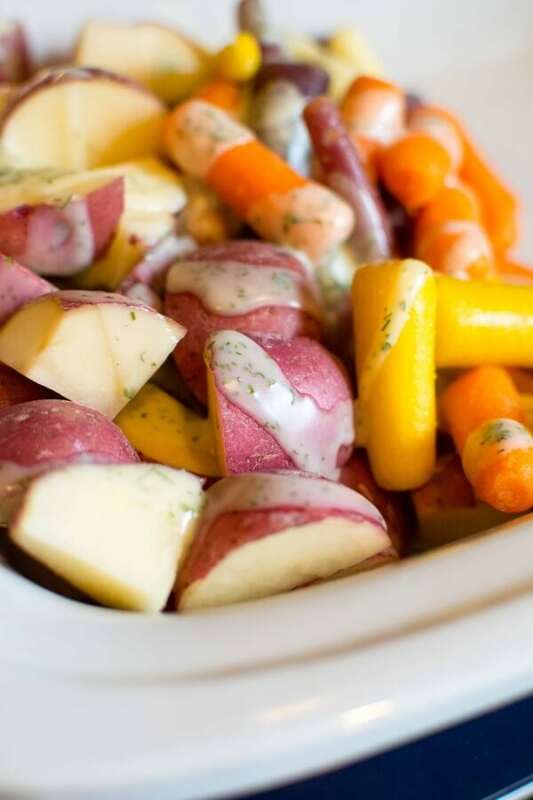 I used a few less potatoes and carrots, and added a few cipollini onions and sliced red pepper. I made no changes in the herbs or butter. Turns out, that they were spot on! I scattered the veggies throughout the cooker and laid the chicken pieces on top. I cooked on low for 6 hours, and the chicken turned out a bit dry. Next time, I’ll check in with the cooking process at 5 hours. Then again, cooking time depends upon the size of the chicken! A couple days later, I placed the leftovers into a ceramic dish and added a bit of beer in the bottom. Covered with foil and warmed it up in my counter-top toaster/convection oven (which I love)! The chicken had become more moist and was quite delicious. I have printed the recipe and definitely intend to make again. Sounds perfect! Thanks for letting me know! I put this in the crock pot just now. I am a little skeptical because there is no liquid. We’ll see . . .
Can you use chicken quarters instead of breasts? Thanks so much for sharing your recipes, I’m going to try this for tonight. I really appreciate how simple your recipes are! Thanks Beth!!! How did your meal turn out? As a bachelor professional, I LOVE fantastic recipes that require just a bit of prep, are easy, cook all day, and are full of flavor. This recipe did not disappoint! The chicken was good, but the carrots and potatoes were OUT OF THIS WORLD. 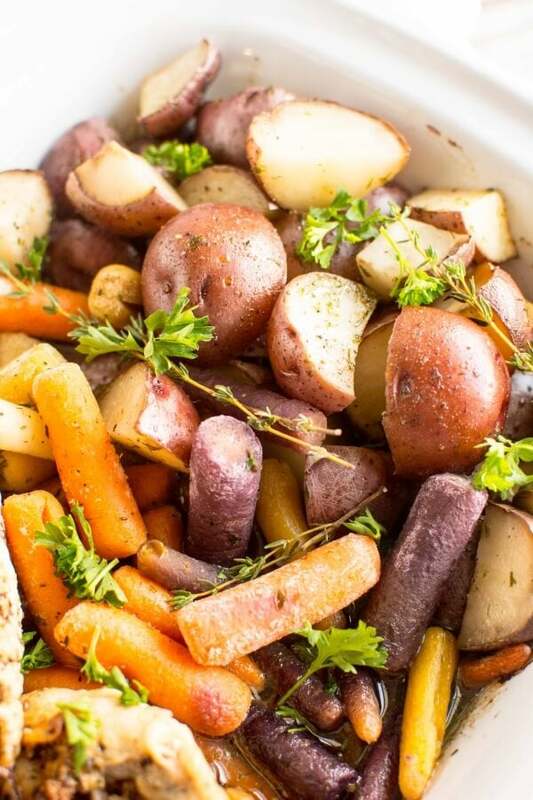 Cooked to perfection, packed with flavor, that dill brought out something incredible in these veggies. Thanks for recipe! That’s great to hear!! I loved the veggies the most too.